I got this book (and the next in the series, Claudia and Mean Janine because I have some students who are really into these adaptations. I was a little surprised, but it makes sense–Raina Telgemeier is really popular with my students. I was really, really obsessed with the original novels when I was in first grade, so I was curious to see how the story and characters would translate into a graphic novel. A minor annoyance turns into an all-out fight, leaving Mary Anne alone at her babysitting jobs; alone at school; and alone dealing with her father’s strict rules. 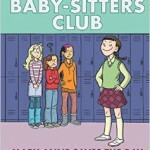 Despite her attempts, the Baby-Sitters Club members can’t even be in the same room as each other. 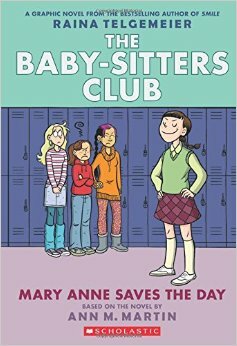 When one of her babysitting charges becomes sick, Mary Anne has to weather the emergency alone. I think this medium works well for this book. I remember the original novels as being full of chatter: from the particular girl’s first person narration; from all the dialogue between characters; from the excerpts of the club’s notebook that intersperse the chapters. In graphic novel form, there is way more breathing room, which I think adds a lot to the story. This story in particular benefits from all that space, since it centers on a huge fight between all four Babysitter’s Club members. The panels of Mary Anne at school with her friends at a distance, all ignoring each other, is really poignant and captures Mary Anne’s newfound isolation. I think the visuals also add another level to how Mary Anne is experiencing the fight, given how ridiculously little-girl her clothes and hair are. You see her going through her day alone, amongst students dressed like normal teenagers, and it drives home how much she stands out without her friends. I also appreciated what the art adds to the story in how the character’s clothes convey much of their personality. In addition to Mary Anne, which I already mentioned, Claudia is infamous in the books for her outfits (and Mary Anne, after this book, dresses a little more “grown-up”). I know the outfit descriptions are a big draw of the original novels, but I always had a harder time visualizing them; partly because I was a seven-year-old who didn’t have much of a fashion vocabulary, and partly because I’m not a very visual person, and clothes descriptions are always a little challenging for me. Being able to see the outfits does a lot of that work, and it puts more focus on what the outfits say about the characters than it does on the actual outrageousness of the outfits. Moreover, because the books alternate first person narratives, outfit descriptions depend a lot on who’s the narrator of that book, and the author’s ability to have that character describe an outfit in a way that makes sense. Like, Mallory is not going to run around describing everyone’s clothes the way that Stacey would. I also really liked seeing what everyone was wearing, and being able to make my own inferences, rather than view them through a Claudia or Stacey lens. (The hilarity of those lenses notwithstanding). I was also really curious about how revised the graphic novel adaptions were–or I guess, adapted is a better word than revised. I was reading the books in the very early ’90s, so the oldest ones were from the ’80s and the most recent ones were contemporary. Someone made the really smart choice to clearly set the books in a more recent time period, while not flaunting the fact. For much of the book, I felt like it was taking place in the early 2000s–I think there is maybe one cell phone reference? Having your own phone line is probably not a big deal for kids anymore, since most middle schoolers have their own cell phones, and the internet (and especially social media) doesn’t really factor in. It’s actually kind of nice, and I think that helps capture what a huge responsibility the girls feel babysitting is. It also goes to the theme of isolation in this book. Mary Anne is trying to deal with the crisis of the club nearly breaking up on her own, feeling totally cut off from the other members at school. Then while babysitting Jenny, Mary Anne tries to handle that emergency on her own (with the help of Dawn). Her actions would be impressive for a 7th grader with a smartphone, but the adults in her life all being unreachable keeps that thread of isolation throughout the story, and lets her act and make decisions on her own, which empowers her to get the club back together and speak out against her dad. Not to belittle Dawn’s assistance, but she really just functions as a prop for Mary Anne’s journey of self-confidence and competence here. I really recommend this adaption for middle grade readers–it’s a story about friendships breaking apart (and reconciling), but it’s really a classic middle schooler redefining herself story, in a totally reasonable way. Even as an adult, it’s easy to see Mary Anne is in the right here, and it’s gratifying to read about a young teenager asserting herself with her father and asking for entirely rational, age-appropriate things (not wearing her hair in braids every day!). This book is huge for Mary Anne’s character development (…such as the series has character development); I remember it being referenced more than once in following books. - Kids love graphic novels! - There's a whole series with AR quizzes!